We are conveniently located in the center of the Southside of Jacksonville. We have competitive pricing with same day appointments. Minimal wait times. Plenty of truck parking. We value our drivers and provide quality care to get you back on the road driving. Thank you for allowing us to care for you. Pass Your DOT Medical Exam! Dr. Lowry knows how important it is that you continue your livelihood as a commercial driver. With his extensive knowledge of the DOT Physical Exam medical guidelines, Dr. Lowry will steer you through the DOT Physical Exam requirements so you can Keep on Truckin’. We are conveniently located off of Butler Blvd and Southside Blvd with easy access from I95 and I295. Dr. Matthew Lowry D.C., is a National Registry Certified Medical Examiner that provides CDL and Non-CDL Physical Exams for drivers. Drivers are our priority! 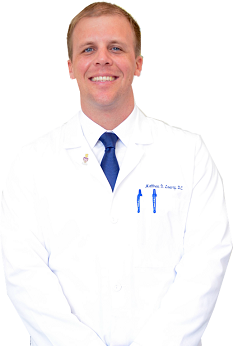 Dr. Lowry is a chiropractor in Jacksonville, FL providing quality chiropractic care and healthcare options to the members of the Jacksonville community and surrounding areas. Dr. Lowry, an auto injury doctor, was raised in Kansas and moved to Florida to attend Palmer College of Chiropractic in Port Orange, FL. Dr. Lowry is a former college baseball player who received his Bachelor’s degree in Kinesiology (Exercise Science) from Kansas State University. During his work towards his undergraduate degree, Dr. Lowry knew he wanted to actively educate and help people achieve a better quality of life through health and wellness. Therefore, he knew that becoming a chiropractor was his ideal opportunity to actively achieve this goal.